How not to measure temperature, part 87: Grilling in the cornhusker state | Watts Up With That? One of the common themes seen with the surfacestations.org project has been the proximity of BBQ grills to official NOAA thermometers used in the United States Historical Climate Network (USHCN). Despite now having surveyed over 77% of the 1221 station network, some truths continue to be self evident. This station was photographed by our prolific volunteer, Eric Gamberg. The proximity to the concrete patio earns this station a CRN4 rating, it may be a CRN5 when they wheel out the BBQ away from the house. But who knows? The grilling schedule is not part of the metadata. I’m not sure why the hinge point is 1978, perhaps that’s when the homeowner acquired the BBQ? Sure, that is an absurd claim, but certainly no more absurd than the GISS homogenization adjustment itself. Adjusting the past increases the overall positive slope of the temperature trend. For those new to the whole concept of USHCN stations, the NOAA thermometer is the white slatted object on the post in the center of the photo. It is known as an MMTS thermometer and a cable goes from it into the home where the volunteer observer will write down the high and low into the B91 logbook and send in the report once a month to the National Climatic Data Center (NCDC).There are more photos of this station which you can see in my online station database. May 28, 2009 in Weather_stations. Good posting. Wonder if it’s possible to put a big red arrow on the photo so it’s totally obvious where the temp sensor is. Without this the photo is less clear. I’m not totally up on the statistical methods used to correct for this kind of thing. I don’t think it’s possible. You would have to surround each weather station with several other stations that did not have concrete paths, BBQ, air-con units etc. They would have to be near enough so you were comparing temperatures from the same place – but if the whole place has been overwhelmed by urbanisation then you would still have measurement errors. You would be comparing rural temperatures from the past with urban temperatures from today. This is so pathetic. Nasa GISS should be thoroughly ashamed that just one of these stations makes it on to the list of stations. The fact that there are so many is just too ridiculous for words. I was told by email that scientists have found the Catlin drilling data of “value”. Still, that’s science now, isn’t it? There was a time not so long ago that science could hold its head up above religion and mock it. Not anymore, I’m afraid. And it’s so sad. Are there any stations where GISS’s application of the “Budgederian Constant” hasn’t dropped historic temperatures or inflated recent ones? Perhaps 1978 was when the temperature record acquired a house and an MMTS? But really, you gotta take your trends wherever you can get ’em! If you check the Reykjavik temperatures on the GISS page http://data.giss.nasa.gov/gistemp/station_data/ and compare the graphs “after combining sources at the same location” versus “after homogenity adjustment”, there is the same unexplainable shift in 1980, where the “homogenity adjustment” puts all pre-1980 temperatures down, even Reykjavik is listed as urban (so opposite adjustment should be logical, to counter possible UHI effect). Looks like a typical readily available BBQ for those times you really want a burger while checking the temperature. The blink comparator just drives home the dishonesty of the corrections made. How is a counter-clockwise twist even plausible for a site like this? Isn’t it obvious that the transition from a cotton region shelter to MMTS sensor on a short wire (which at a scientific wild a** guess occurred in 1978 where the blink is hinging) would have provided a hot bias? Amusingly, the large graphic ad showing between the article and the comments is for a line of grills and the store to buy them from. It is a nice break from the steady diet of pro-AGW sites that adsense usually seems to offer, though. Those ads wind me up too. I think run-of-the-mill webmasters using Adsense can block specific sites from displaying ads on their pages. Perhaps Anthony can do that… or perhaps not… it depends on the relationship he has with Google/Wordpress. I do find it incongruent, though, to see adverts enthusing me to help save the planet from AGW on this blog. Let’s see – winds blocked in two directions (N/S), located next to a concrete surface, and worse, located close to the south-facing walls of a house. Nice comparator. I noticed that there’s another hinge point around 1920. Anything to steepen the slope. Have you quantified the effect of a BBQ at varying distances from the sensor – the sensor should be proof against radiation else the design is worthless (it has to be proof against a few 1000 deg radiation from the sun), and a BBQ convection heat will predominantly go vertically above it (with wind variations). Similar quantification is required for the location of tarmac/concrete paths, air conditioners, and buildings. In the other direction, shading by trees and buildings. If you have a sensor these test could easily be completed in a couple of weeks. Logically I would suggest that convection will have little effect if the source is more than a couple of metres away. Shading should have no effect unless the shading creates a “sun trap”. The base under the sensor will create a difference as the convected air will enter the sensor. If the surroundings have changed only once then there should be a step change – not year on year change. The plot above does not seem to show such a step change. The way the pole tilts at 10 degrees from vertical tells us just how much care has been put into the installation and maintenance of this unit. I think you would have to do some kind of cusum analysis to see if there was a step change in the data. Anyone ? The siting violates the written standard for surface stations. This sloppiness makes any data questionable, if not completely unusable. Looking at the blink gif in the article it’s clear that something is wrong, wouldn’t you agree? The result of GISS’ massaging the data always seems to show temperatures rising faster than they really are. What are the odds, eh? That looks like a clothesline carousel on the patio. That should raise the relative humidity a smidgen on laundry days. However, it is an improvement over the sensors sited at wastewater treatment plants. Put me down as being delighted with the blink ad for barbeque grills that was mated to this article. What a hoot! On a serious note though, (and I believe you allude to this) why if they are accounting for a house being built and adjusting the temps, are they adjusting the temps before 1978 instead of after. That way skews historical data in favor of skewed data, brilliant. siting obviously should not violate standards. But for the purposes of GW you are not trying for absolute accuracy – just difference. It could be placed at the centre of a 10km diameter section black tarmac. The temperature will be wrong – the max and min and average will be wrong – but the changes in the max/min will reflect changes in temperature. At a guess in 1980 a mercury thermometer screen measurement was replaced with a MMTS. Perhaps these have slightly differen absolute temperatures? C. They also concluded that the MMTS was likely a more accurate temperature measurement than the instruments they replaced. of State Climatologists (see information online at www. Can you prove that the adjustment is always one way ? At least the house isn’t painted white. “Skewered” data, please. Measuring climate change is like shish kabob – a little of this, a little of that, a lot of sauce to fix the final product. 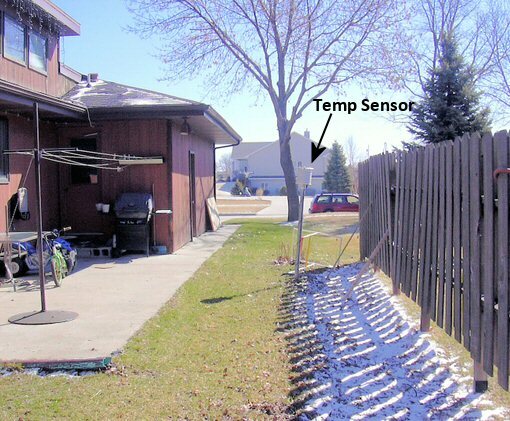 Not only will the temps be scewed cooler from the evaporative cooling of the clothes on the clothesline, but more serious is the fence which prevents the Sun from melting the snow under the right side of the sensor. Complaints about the barbecue are frivolous. Seriously, judging by the snow on the ground from the shading by the fence and the proximity to the concrete patio (with humidity enhancing clothes drying apparatus), this station has so many microsite biases up and down that no temperature reading can be trustworthy. I’ll bet the kids (see the small bike?) are hanging on the sensor pole all the time too, causing the tilt and who knows what damage to the equipment. Once again the homogenized data clearly shows that the “corrections” are not only the wrong size but the wrong direction. Is anyone trying to fix this obviously flawed process? Anyone at USHCN that is? Hmmm. Wouldn’t they make that adjustment (down) if the homeowner had sold the BBQ in 1978. It ought to bias things upward. Or perhaps they switched to a different brand of charcoal? Seems to me like the GISS adjustment should be going the other way. If urban now and rural previously that would mean older temps would have been cooler and should be adjusted UPWARD to match the current situation. In fairness, the hinge point is probably correct. Only thing is the right side of the hinge, 1978 on, should go down rather than the left side, before 1978 going up. I disagree. This one is spot on-code. The BBQ is exactly where it should be. In addition, they must have read the instructions very carefully because they have no metal boat nearby. That said, there should be evidence of a burn barrel. Without verification of that necessary piece of equipment, my rating is temporary. I think I have the solution to all those temp sensors located in questionable areas… Paint everything white within a 50 yard radius of the temp sensor. Here in the UK, the Met Office has told us to prepare for a summer with frequent BBQs. I wonder if the same advice has been offered to the Volunteer Observers in the USHCN? That’ll help the summer temperatures climb. Look at the (older) WUWT chart of how many times the individual year’s “average” have been re-calculated from 1860 through 2008. (Last year, June’s archives.) Records before 1968 were changed an AVERAGE of 36 times, with almost ALL of the historical temperatures for each year changing between 36 and 46 times. Records AFTER 1978 were changed as well, but even more frequently. The 1935-1945 years, previously at +0.4 to +0.5 degrees above the arbitrary zero point of 1973 (right at the hinge point => coincidence? => NOT !) are now substantially cooler by 1/4 degree, which CREATES the entire global warming hysteria. Of course, if 1935-1945 were as hot as actually recorded, then the entire premise of Hansen’s global warming is destroyed, and the government loses the opportunity to get 1.3 trillion in taxes. I thought we agreed this photo needed a “big red arrow” – that is now clearly and distinctly a “small black arrow” …. Every one of these reports strikes like the slow clang of a bell as family and friends watch the body of a loved one lowered into the ground. It is time to move on and use the current satellite technology for climate studies. Local sensors such as these shown in this series ought not to be used for anything other than locally in newspapers, radio, and television reports. In such venues the interest is whether it will be hot or cold, windy or calm, and rain, snow, or not. All to within a few percent accuracy. Anyone, anywhere, who shows any digits to the right of the decimal point when reporting such numbers should be publicly whacked with a rubber facsimile of a MMTS. Also, I think one of the folks that has made these temperature corrections (adjustments, fixes, whatever!?) ought to be required to explain what they are doing and why? If the assumption is that the previous sensor was biased on the high side then maybe it makes sense to “adjust” those numbers down. If there is an urban heat effect then the recent numbers (since growth began) could be gradually brought back down. In the first case a simple reduction for all the readings could be done if the two instruments were operated side-by-side for a few months. In the second case the adjustment would have to be on a sliding scale based on the rate of urban (heat producing) growth. How? Population growth. Area of concrete and asphalt and black roofs. Number of vehicles registered. If a sensor location is moved – what then? An increase in elevation or a decrease adds another intractable issue. Combine several of these problems and the data becomes useless for larger scale climate analyses. I now toss the first shovel full of dirt on to the coffin of this departed friend. Is Hansen’s adjustment method explained anywhere? If not has anyone filed a FOIA to force him to release it? OT, but I love the google ad for grills right after this entry. How appropriate. Perhaps Mr. Watts could develop a line of NOAA approved grills with heat deflectors to be used in proximity to MMTS temperature sensors! The only thing I could find in the “station history” file was a move of 0.8 miles South on May 1, 1983, which resulted in a change of -12 ft’ in elevation. Another move of x miles on 11/1/43 resulted in no elevation change. Bill seems to (willfully?) forget that such microsite biases can change the anomaly on any given day/week/month/year, thus skew(er)ing the resulting data. What if they had a party, lots of people standing around the BBQ and MMTS, you’d surely get some strange readings as the ambient air temp did some strange things for several hours. I can’t help but think the fence affects things too. notice the unmelted snow right at the base of the MMTS and all along the fence. But the MMTS itself is in the sunlight. What does that do to the ambient air temp being recorded? I think the tilt of the MMTS pole is a good bit of engineering. I’m sure it helps keep the MMTS off the ground each time that the fence collapses onto it. And for you British chaps unfamiliar with American architecture, the style of the house has been popular since the 1960s. The slightly more complex shape around the garage increases the chance that it is younger than the 1970s. The large house across the street is probably less than 25 years old. This house has probably been built on site with 2×4 lumber framing on a concrete slab foundation or cinder block basement. This is prairie country on glacial till, so basements are not hard to dig. Some houses a block north, closer to downtown, look like they are from the 1930-1940s, so this area was probably built as individual houses from 1960-1980. Yup, pretty meager when we can only describe houses by the decade rather than the century. As I scrolled past the advertisement block, what did my wondering eyes behold? GrillsDirect.com! Ahhhh, the irony is as delicious as a T-bone grilled to perfection beneath a NOAA thermometer. Perhaps because starting in 1979 there is satellite data available, so you can’t fudge data since it would be obvious against the independent satellite measurements. Prior to 1979, there is no independent check. I’ve often thought that we need to be less concerned with what GISS is doing with current data than with what they are doing with data prior to 1979 to inflate global temperature increase estimates. I love the Google Automatic Advertising. Did anyone else note the advertisment for “Outdoor Grills” what showed up with this article. Aren’t robots wonderful! Funny they don’t advertize Weather Stations/Temperature sensors. Or better yet statisitical analysis packages, as MiniTAB (TM) or the like. Well, it ought to be 1979 if I’m reading the code right, then again, it is a somewhat adaptive program and might have “decided” that 1979 was OK. A “hinge point” on or about 1979 in GIStemp comes from STEP0 where they “unoffset” the data. Basically, they mix together USHCN and GHCN in an absurd way. The two datasets are compared from 1980 forward and an ‘offset” is computed. This “offset” is then used to rewrite all prior history. The “notion” is to remove the “adjustments” from the data they want to use (that has NOAA adjustments in it) but comparing it to an un-adjusted series to get an offset. The idea is that if the equipment changed in 1990 and NOAA adjusted for that, we want to remove the NOAA adjustment. The reality is that the new equipment adjustment is applied to all history for the site. Exactly what would a new thermometer in 1990 have to do with temperatures recorded in 1940? It is just a seriously broken step and ought to be attacked by someone with academic credentials with rigor and relish. I wish no one would think of such sites as “weather stations.” All they “measure,” if we can use that term loosely, are surface temperatures. Weather, and climate for that matter, are described by a few more parameters than surface temperature. I wonder what “homogenized” weather or climate would be like, and where it might exist? Rod Smith, precipitation is also measured. Well I like the blink comparator more than I like the owl box. I find the 1978 jitter point to be interesting, because it is somewhere around there when they put out the first ocean buoys that measured sea air and water temperatures simultanously; which showed that all the sea water data taken before then was useless for constructing lower troposphere air temperatures. So i don’t believe any “proxy” temperature data before the 1980 time frame, and those buoys showed that sea water temperature from some arbitrary ocean depth is not a satisfactory proxy for lower troposphere temperatures, at 60 inches from the concrete; or wherever the owl boxes are sited. I still believe that UHI are not a problem for temperature data gathering; after all the planet lives with UHIs all the time, without any problems at all. The problem is that the data modellers insist on using those UHI temperature measurments far away from where they have any validity; in other words UHIs are a problem of Nyquist sampling errors; they are actually good for cooling the planet, since if they are at a higher temperature, then they radiate infra-red at a faster clip, thereby cooling the planet faster than a colder place does. That south facing natural wood picket fence looks like another local adjustment knob too. Well some of us are. Most kinds of tomatoes don’t set fruit below about 50F. I don’t care, nor do they care, if you are reporting 55 F when it isn’t. Both my tomatoes, and I, care about the real temperature and is it really over 50F. In the real world the real people who use this “product” for real decisions want real temperatures because real things behave in real ways. Only anomalies are anomalous. just difference. It could be placed at the centre of a 10km diameter section black tarmac. The temperature will be wrong – the max and min and average will be wrong – but the changes in the max/min will reflect changes in temperature. Notice that mo0 is the USHCN data while mo it the GHCN data (cryptic eh?) and that these are always subtracted in the same direction. Recent “changes” always create a subtracted offset. This is then used to create a “difference” dif that in the next step gets subtracted. Notice that the “dif” is always subtracted. This step, which hinges at about 1979, always subtracts from the past. Now the theory is that NOAA has put in UHI adjustments (negative) in the recent data and that this ought to be subtracted it to “unadjust” it. The effect is that all adjustments (TOB, equipment, you name it) get subtracted. But NOT just from the times they existed, FROM ALL HISTORY. This, IMHO, is where the axe ought to be lowered first on GIStemp. I am having a discussion on another website about mountain pine beetles and the threat to the grizzzly bear population in the Greater Yellowstone Ecosystem. (see http://switchboard.nrdc.org/blogs/mskoglund/global_warming_dead_forests_im_1.html ) The author sent me this presentation ( http://www.fs.fed.us/psw/cirmount/meetings/agu/pdf2007/redmond_talk_agu2007.pdf ) which prompted me to go look at weather stations in the Western States. It includes some charts I am not very comfortable. I went to http://www.surfacestations.org/USHCN_stationlist.htm which is very handy to check on the distribution of weather stations in the Western States particular those above 5000 feet. Unfortunately I couldn’t find an explanation for the columns labeled trend_raw, trend_tobs, and trend_filnet. I can guess but it would help if somebody could provide official definitions including start and end years for the trend calculation if it is not the full record. Also if anyone is an expert on mountain pine beetles any detailed references on their sensitivity to temperature would be very helpful. Any possibility of a time-of-observation (TOBS) change circa 1979? A switch from early morning to early evening at that time could (possibly) justify this type of correction. I can’t find anything that records this type of change. And this, IMHO, is the nub of it. A clear decision was made in writing the code to rewrite the entire past history every time the code is run. Any programmer with half a brain (right half! 😉 would resist that. A clear decision was made to alter all of past history to remove a small bit of recent “adjustment” – on the face of it that is bogus and any decent programmer would point out the absurdity of it. There is nothing magic about 1979 being a shift point. Different stations have been assigned different shift or tilt points for one reason and one reason only. I t is to rewrite the record so that 1934 no longer is the highest anual temperature in the continental U.S.
Shame on positioning, shame of changing the past 1985 style. He who controls the past, controls the future. Winston, please correct and drop the older version down the “memory hole”. Keith (09:54:48) :Perhaps because starting in 1979 there is satellite data available, so you can’t fudge data since it would be obvious against the independent satellite measurements. Interesting point… I have wondered why they chose that date in the code. To fend of the inevitable troll who will assert that the sea temperature anomaly map is based on satellite data, the last time this can around I went down the rabbit hole and sorted it out. It uses a hypothetical synthetic sea surface temperature anomaly product based on ships, boats, buoys, oh and a bit of satellites including estimates of polar ice (broken satellite sensors anyone?) used to make synthetic polar temperatures that are then interpolated and projected…. not satellite data. I am loving the ads as they are always so perfect for the post. In this case gas grills. I think these must be taylored. I especially laugh at all the green ads and the save the polar bears. The bottom line: NASA applies an urban correction of its GISS temperature index in the wrong direction in 45% of the adjustments. Instead of eliminating the urbanization effects, these wrong-way corrections makes the urban warming trends steeper. Every good BBQ grill needs an MMTS thermometer for accurate cooking. I’m ordering mine today (MMTS that is). Once I get it working, I’m going to call Bobby Flay and see if we can have an AGW (American Great Western) BBQ throw down. The winner’s recipe and temperature series will be added to the GISS database according to standard practices. Sorry for the typo. I meant to say “The winner’s reconstructed temperature series will be added to the GISS database according to standard practices.” There’s no field for recipes in the GISS database. I knew that. Of course you are correct. I was responding to the comment that these sites should not be called weather stations because they only recorded temperatures. I’ve been hitting this site and others like it, as well as a fair selection of contrary sites, for years. In that time I have encountered examples of uptrend enhancing adjustments numerous times. I don’t have a precise count, but a good SWAG would put the number well into triple digits. I may have seen a down trend enhancing adjustment noted somewhere in the past, but I may be experiencing early Alzhiemer’s symptoms, since I can’t recall one just now. Perhaps you could help me out by posting links to 5 or 10 examples of that phenomenon. Being a firm believer in the scientific method myself, that would be sufficient to cause me to question the validity of the hypothesis. I think if an alien civilization was observing Earth they would think BBQ grills and AC units are part of the station monitor accessories and that sewage treatment plants are ideal locations for MMTS units. The best example of how the south side of a building raises temperature can be found by looking at the grass. Next to the house/pavement it is already green but look across the street and the grass in the open is still brown. Also, the unmelted snow near the fence is a great example of how reducing solar isolation can affect the melting of ice/snow cover. Keep in mind the TSI would have been the same everywhere at the time the picture was taken. The point being that changes in solar isolation are much more pertinent to periods of glaciation than changes in TSI. put 2 concrete barriers in front of the Stevenson box that you see in the above picture. I’m thinking of offering to paint them Forest Service Green. then selected raw or after adjustment and then downloaded data. Basically for five sites the changes are sometimes positive sometimes negative and sometimes fairly neutral. 5 is a pretty small sample but not “all” the changes trend towards an increase in temperature. Take away the house, trees, concrete and bbq and leave the fence and the associated ‘shadow’ it provides. What does this do to the temperatures recorded at the station? It is clear that the ground is snow covered and frozen directly beneath the sensor whereas the open ground visible in the distance has no obvious snow and is probably not frozen. A simple experiment measuring temperatures directly above ice as compared to grass-covered earth (of various temperatures) could be undertaken to establish a graph of temperature readings which would show the influence that this situation has on temperature recordings. Has anyone tried this? What’s really needed is a complete revamping of the surface temperature station network. The network administrators need to do some site surveys to ensure that future sites are better sited than current ones. Secondly, the entire system should be automated, with sensors collecting temperature, humidity, and barometric pressure and uploading that data once a day to an orbiting satellite. That would remove several factors from consideration: poorly sited instrumentation, human error, and (at least for a short time) eliminating the need to correct for extended human activity. I’m sure a fully-modernized, solar-powered unit could be constructed for around $2000 each. A satellite is expensive, but there’s no reason NASA can’t put a package together that could be added to a previously-scheduled satellite. Since the areas populated by these sensors would only be in the northern hemisphere, a polar orbit would not be necessary. No one can make the types of decisions that we, the people of the US, are being required to make without first ensuring the truth of the data we’re relying on to make those decisions. That degree of integrity is not present in the currently publically-available data. I’m saving up to buy the official GISS BBQ grill and nearby rusty trash-burning barrel to bookend my Stevenson screen. For my own town (Weaverville RS), GISS has July 1986 beating out August 1932, for which there is no equal in the actual data record. There is no record for July 1986 in the data, so therefore it is assumed to be through the roof by GISS. I see what you mean by GISS barbecuing where there is nothing to fry. Sorry if I wasn’t clear, but I know that. About a year ago, I compared the monthly GISS global anomaly against both RSS and UAH, and once you correct for the differences in the base periods, the anomalies match quite closely for the period post 1979. My point was that the GISS team can’t play too loose with the data from 1979 onwards since it is easy to verify against a satellite record. Prior to 1979, however, they could engage in all kinds of shenanigans to make the past appear slightly cooler than it actually was. That FORTRAN code is seriously poor style. I have done professional programming in FORTRAN for ~15 years (until about 1995). Such chaotic coding is always, always a sign of poor design and understanding. It is probably riddled with algorithmic bugs (in addition to the fact that the algorithms are wrong in the first place, as you indicate). The style of the coding looks like it has been done by someone taking a crash course in Fortran some time in the mid 1970s. The FORTRAN 66 standard (from 1966) would produce similar code (except for the lowercase and enddo’s). The FORTRAN 77 ANSI standard (it is still in my bookshelf) would at least let you program with almost no GOTOs, if-then-else and such. Today, such code should be properly designed using a modern language and people with some competence in software design and implementation. Especially when decisions costing trillions are based on it. To me it looks as if GISS are trying hard to correct measurement errors – not trying to falsify the temperature record. Also of interest to E.M.Smith (11:02:57) : is that 1979 hinge does not always occur and certainly is not always negative! I’m not sure where the code came from but it is not the same code as giss use. giss changes on years other than 1997 and will change either up or down – which e.m. smith claims is impossible. There is a website devoted to converting the hodge podge of languages to python (just do a search on “dif.ushcn.ghcn.f” there are not many results) – If you would like to help out you can sign up! I’m sorry to be so slow responding to your comments, but I’ve been otherwise occupied. I’d have to grant you 4 out of 7 for meeting my criteria of down trend enhancing adjustments. The last 2 only work if the adjustment profile is a record of adjustments made in the past and not a present day revision of the historical record and Cooperstown is marginal. I suspect a full 1 degree reduction in the start point more than compensates for a 0.1 degree bump in the middle. But, though I’m not sure I’ve ever used the phrase “the adjustments are always up” in the past, if I have occasion to refer to this situation in the future I will do my best to insert an almost. Personally, I suspect that the entire surface station network is so throughly compromised that no amount of statistical manipulation, no matter how diligently it is performed, is likely to produce data that has real relevance to what is occurring in the actual world. 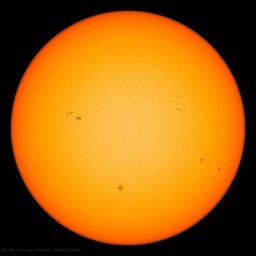 My own objection to the AGW agenda has little to do with whether and to what degree warming has occurred in the past or will occur in the future but to my own conclusion that if humanity proceeds to produce and distribute as much energy as we can to as many people as possible the future that develops will be infinitely preferable to the one provided by following the carbon demonization scenario, no matter what the climate may be in a hundred years. BTW, can anybody explain to me what’s going on with the adjustments to that ” Huron/ Huron R” station that bill linked? OK to finally put to bed these idiotic and disingenuous statements that GISS are “adjusting” the temperatures to prove global warming here is a random selection of locations with their adjustments. To me they look rather like someone trying to correct inconsistencies NOT someone trying to depress early temperatures. I have plotted all I looked at (both up and down adjustments) – no cherry picking other than sites with long and recent measurements. According to the weatherman tonight in Sydney, Australia, May 2009 was 0.8c above the “long term average”. Not sure how this “long term average” was derived however. You’re mentioned in my local newspaper today! For those new to the whole concept of USHCN stations, the NOAA thermometer is the white slatted object on the post in the center of the photo. It is known as an MMTS thermometer and a cable goes from it into the home where the volunteer observer will write down the high and low into the B91 logbook and send in the report once a month to the National Climatic Data Center (NCDC). WTF? It’s not automated? How absurd. How many of the stations are manual, or involve some manual processing of the data by humans? The fact that some of the stations are not automated raises the red flag of not just HUMAN ERROR but willful deceit for various reasons. That’s not even counting the scientists who massage the data later in the process. It’s still the 1950’s in climate science technology it seems. It also doesn’t seem like the the climate scientists have learned anything from the quality control experts in high tech manufacturing. Now that’s funny! Wouldn’t it be fun to make up a GISS BBQ logo, and make up an infomercial for the new grill, complete with a British pitch-man, and catchy new recipes for dishes like “Urban Heat Polar Bear with Hinge Point Marmalade, on a bed of Stevenson Greens… Anyone have any others, I think a short You-Tube video of this would be fun to make. For good product placement, we could feature Dr Hansen’s Hellacious Habanero sauce, with a Gore “Storm Surge” chaser. For later, be sure to try Cap’n Trader’s sequestration sorbet! Lose the handy “Scientific Method Skewer”, get a new one free, just pay separate shipping and handling!